Daksh Resort & Amusment Park is situated in Sasan Gir which is well known national park and is considered as the sole dwelling of the pure Asiatic Lions. This place is well known as the most important protected areas in Asia. Daksh Resort House is all time favourite farm resort while visiting the famous Asiatic lions at Sasan Gir. Daksh Resort offers a value for money stay to all the guest at an affordable rate. Easy mode of transportation to the hotel is available through Keshod Airport and Veraval Railway station that are well connected to all major cities. The flawless and friendly nature of the hotel is full with all modern amenities like front desk, laundry, parking, airport transfer, doctor on request and other needed for a relax and comfortable stay. While staying here, guests can enjoy a refreshing dip in the swimming pool or simply relax beside it. Relish authentic and flavorful dishes in the serene ambiance of the in-house swanky restaurant. One can have gala time around camp fire with family and friends. The supportive staff of the hotel ensures that all whims of guest are timely fulfilled. The aesthetically elegant and contemporary tents promise immaculate bed-linens and linen in addition to facilities like telephone, television and air-conditioner. One can enjoy recreational activities like bird watching, jeep safari, bullock cart ride, river bathing, siddi dance, bonfire, star watching, night walk and folk dances for guests to have a great time. 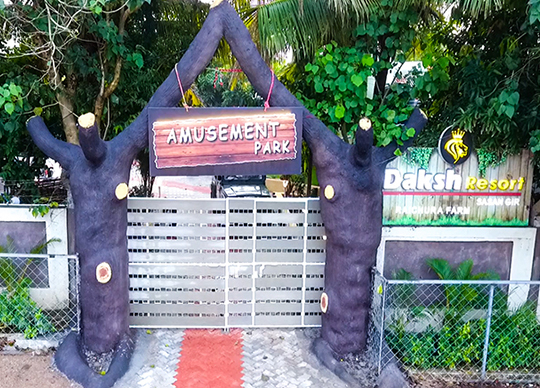 Unwind and have a pleasant stay at Daksh Resort & Amusement Park !